Being the food-loving blogger that I am, a restrictive diet can be really challenging. Food needs to taste good. Really good. The idea for this Creamy Buffalo Chicken Cauliflower Casserole had been a long time coming. I was inspired to make this simple dinner recipe by my love for any and all things made with Buffalo sauce – especially Buffalo Chicken Dip. Because the sauce has 0 calories, and therefore 0 carbs, it’s a great condiment to use to add big flavor! In fact, I love Buffalo sauce so much that it has inspired quite a few other recipes! Bacon Wrapped Buffalo Chicken Poppers, Buffalo Chicken Pizza, and Buffalo Chicken Salad are three more low carb recipes where Buffalo chicken is the star! 5 ingredients is all it takes to make this super flavorful casserole dish! Cream cheese is blended with a sharp cheddar cheese for a smooth, creamy base. Classic Buffalo sauce brings plenty flavor and spiciness. Cauliflower rice is used in place of regular rice to reduce the carbohydrates. Chunks of chicken add plenty of protein making this casserole suitable for those on low carb or keto diets. Set the cream cheese out to come to room temperature about an hour before you begin to make mixing a bit easier. You can skip this step, but the casserole mixture will be harder to combine. Dice and cook your chicken, or shred it, if preferred. Leftover or rotisserie chicken works great for this recipe! I also like to use my Instant Pot to cook the chicken which makes it super easy to dice and shred. Rice the cauliflower. I recommend using fresh cauliflower, when possible. Using frozen may give you a runnier sauce. You can rice the cauliflower by using a grater or by adding the florets to a food processor and pulsing a few times until it resembles rice. Shred the cheddar cheese. It is not recommended to use a bagged shredded cheese as it contains a starch to keep it from sticking together. 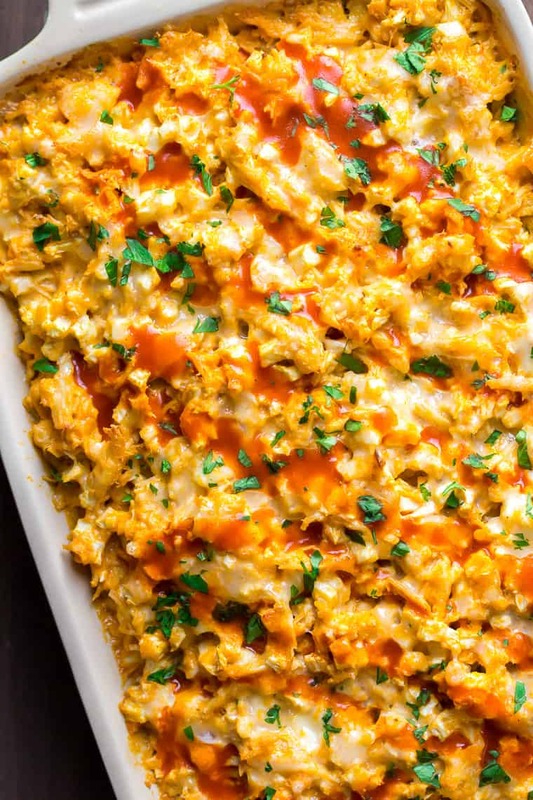 That starch makes it so the cheese doesn’t melt as nicely and increases the carb count of this Creamy Buffalo Chicken Cauliflower Casserole recipe. In a large bowl, combine the chicken, riced cauliflower, buffalo sauce, cream cheese, and half of the cheddar cheese. The mixture will be thick. Spread into a medium casserole dish. Top the Creamy Buffalo Chicken Cauliflower Casserole is with extra Buffalo sauce and fresh, minced parsley, if desired. 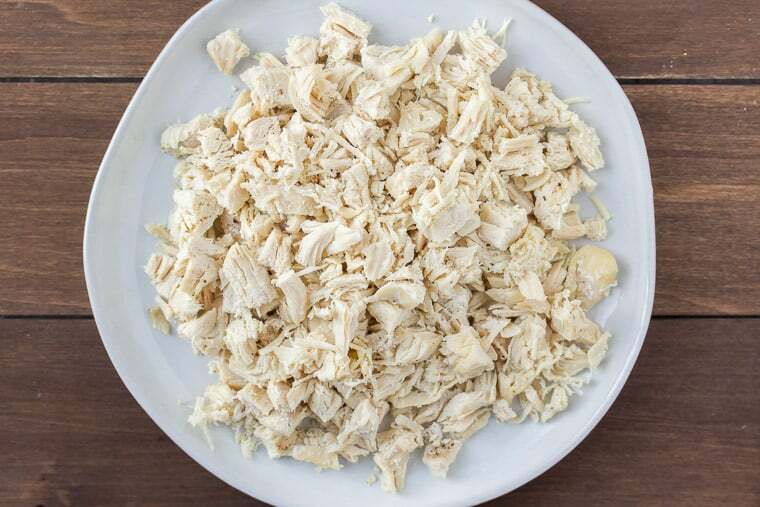 Cut the chicken into bite size cubes and cook in a skillet with olive oil until just done through, or use an Instant Pot, or use leftover or rotisserie chicken to save time. I recommend using fresh cauliflower, when possible. Using frozen may give you a runnier sauce. You can rice the cauliflower by using a grater or by adding the florets to a food processor and pulsing a few times until it resembles rice. Can store Buffalo Chicken Casserole in the freezer? Yes, it can be stored tightly covered and unbaked, for up to 6 months. Thaw in the refrigerator before baking. Increase the cook time to 35 minutes covered, then 10 minutes uncovered. 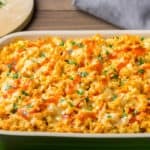 Can Buffalo Chicken Casserole be made ahead of time? This casserole can be made ahead of time and kept in the refrigerator, tightly covered. It is recommended to bake it within 2 days. Increase the cook time to 35 minutes covered, then 10 minutes uncovered. 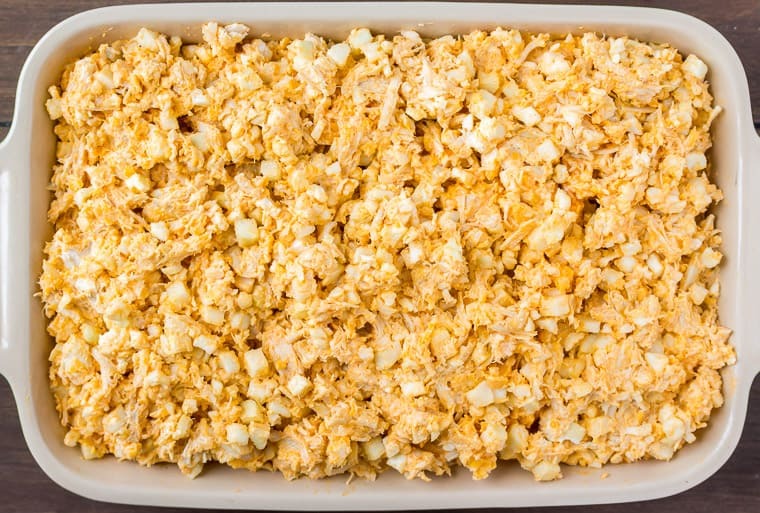 How long can you store leftover Buffalo Chicken Casserole? Store any leftover casserole in an air-tight container in the refrigerator. Use within 3-4 days. 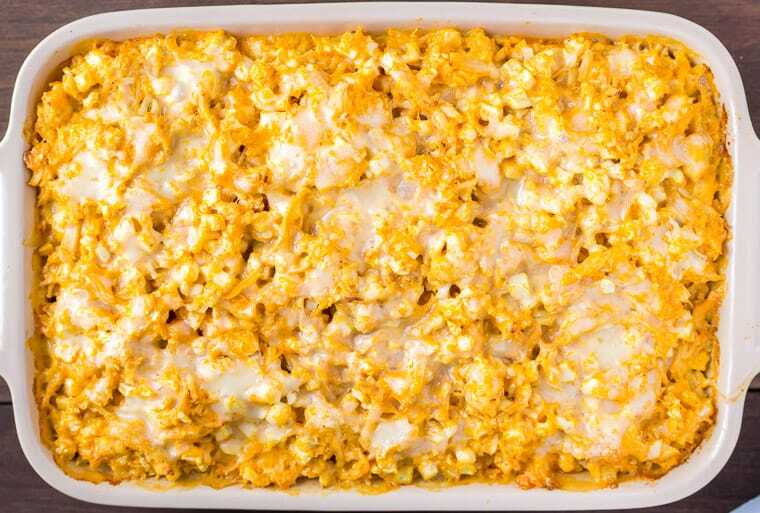 Love this Creamy Buffalo Chicken Cauliflower Casserole recipe? Follow me on Pinterest, Instagram, and Facebook for more! 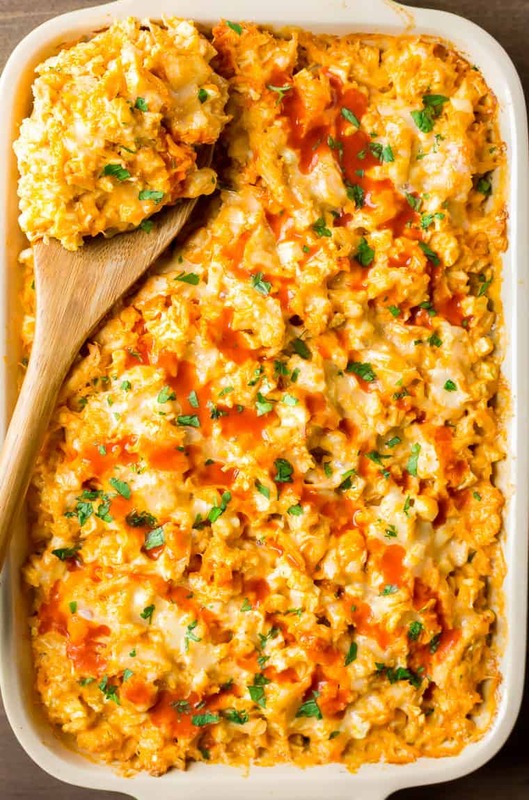 Creamy Buffalo Chicken Cauliflower Casserole is cheesy, spicy, and crazy delicious! It's low in carbs, suitable for those following a keto diet, and gluten free! It is best to shred the sharp cheddar cheese from a block rather than buying a bag of pre-shredded cheese which contains a starch and doesn't melt as well. This recipe was originally published on October 26, 2017. Images and text were updated in January 2019. No changes were made to the recipe itself.